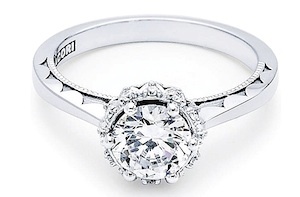 Let this brilliant round diamond take center stage! 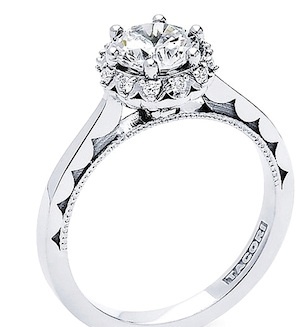 Tacori Engagement Ring 592RD. The aerial perspective of this luxurious piece reveals the true beauty of this stunning design. The balance between the high-polished ceiling and the unique spotlight diamonds that light up your choice of a center stone, create a truly harmonious engagement ring. The inner face is delicately detailed with our sculpted crescent design.